This is one of my favorite recipes EVER. 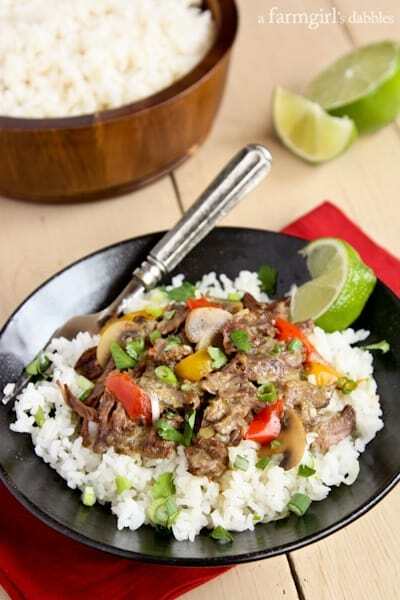 Slow Cooker Coconut Curry Beef. My friend Stephanie (local Minnesota foodie extraordinaire, organizer of our active Minnesota food bloggers group, and owner of the blog fresh tart) posted her original braised recipe over three years ago, and I’ve been making it ever since. My printed copy from Stephanie’s site is smudged and splattered and wrinkled and written on, and always stored in a special drawer…all loving indications of a well used recipe here in this house. I’ve sent my friends and family to fresh tart for Stephanie’s braised version of this recipe more times than I can count. It’s a recipe that I count on, and one that I’ll always make, as I love braising in our Le Creuset French oven. But I’ve had a number of people ask me to give them instructions for a slow cooker method, as they haven’t yet invested in a French oven, or they simply love their slow cookers. So here’s my tried and true slow cooker version that includes some of my own ingredients adjustments, tweaked a bit over the years for my family’s taste buds. If you love a beef pot roast that falls apart, all tender and incredibly flavorful from hours in a slow cooker, then you must give this recipe a try. The coconut milk lends silky texture. And the green Thai curry paste, one of my most beloved pantry items, lends warm spiced flavor. Together, these two ingredients are the base for a dish that is wonderful beyond words. 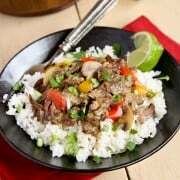 There are plenty of fresh veggies in this pot of coconut curry beef, but you could easily add more to amp up your family’s veggie consumption. I love the addition of mushrooms, which I always include in both the braiser and slow cooker versions. I also mix it up occasionally by adding more bell peppers, some thinly sliced carrots, and/or halved fresh pea pods. When I’m needing a little kick, some minced fresh jalapeño is always a fab addition. It’s great every which way you can dream up. You simply can’t go wrong. Change it up to your family’s taste buds…that’s what great cooking is all about! I own a multicooker that allows me to both brown and slow cook in the same appliance. If you do not have this functionality, start by heating a large heavy pot or French oven over medium-high heat. Sprinkle beef pieces fairly generously with salt. Add oil to the pan. When oil is hot and shimmery, add the beef pieces and brown so that each side has a beautiful browned crust to it. Remove beef to slow cooker and turn heat to the low setting. If you own a multicooker, turn heat to the brown/sauté setting and let it heat up for a minute or two. Add oil. When oil is hot and shimmery, add the beef pieces and brown so that each side has a beautiful browned crust to it. To the slow cooker, add the coconut milk, curry paste, lime zest and juice, fish sauce, brown sugar, cumin, and red pepper flakes. Stir to combine. Then add onion, bell peppers, mushrooms, garlic, ginger, and black pepper. Stir to coat all of the veggies with the coconut milk mixture. Cover slow cooker and turn heat setting to high. Cook for 4 to 5 hours, or until beef is fork tender and falling apart. Remove beef to a cutting board and pull apart using two forks. Add beef back to the slow cooker. 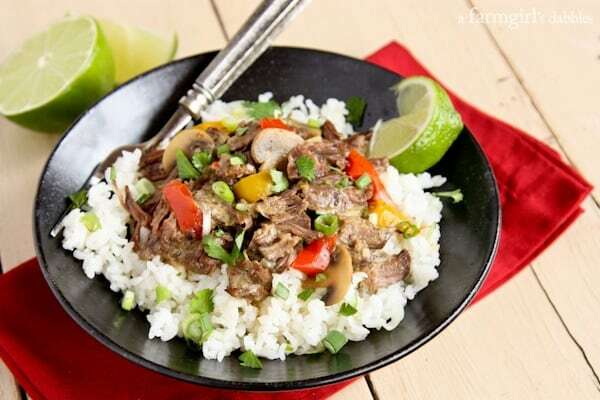 Serve over hot rice, with scallions, cilantro, and lime wedges on the side. Feel free to experiment with your favorite veggies in this dish. To mix it up, I also like to include more bell peppers, thinly sliced carrots, halved fresh pea pods, and minced fresh jalapeño. If you aren’t fond of cilantro, try thinly sliced fresh basil, as Stephanie includes in her original braised recipe. Change it up to your family’s taste buds…that’s what great cooking is all about! For braising preparation instructions using a French oven, please visit the original braised recipe from Stephanie at fresh tart. Adapted from my friend Stephanie’s recipe box on fresh tart, “Beef Braised in Coconut Milk”, one of my favorite recipes for braising in my Le Creuset French oven!